I have been totally preoccupied, which explains my recent radio silence. Our youngest son has encountered some serious health problems involving his digestive system, which has been accompanied by numerous trips to the hospital. Talk about being frightened out of my wits, many sleepless nights and feeling utterly helpless. They have figured out a way to stabilize things and he is now pretty okay pain-wise but this has been quite a journey into unfamiliar territory for our family. When they say that all that really matters is good health, it is so true. It is without a doubt, what’s most important. He went for a week without consuming anything orally. Not even water. He was hooked up to an IV of course, but nothing to digest to give all of his organs a rest. He lost a lot of weight. He can now eat gingerly, trying tiny bits of things as we go along, with everything being very low fat. So obviously, this is a new way of cooking for me. Starting with clear broths (only vegetable stock, not even chicken) and steamed rice, we are graduating to skinless, boneless chicken breasts, plain steamed carrots and green beans and trying to figure out ingenious ways to do everything with little or no butter or oil. Now I’ve never been a fan of using a lot of butter but this is a heightened awareness, and you know what? I think I like this super clean way of cooking and eating. This forces you to really stretch and consider ingredients that will add the most flavor and interest. And I’m finding this particularly enjoyable and a welcome respite in the midst of this fattening, rich holiday season. There’s a silver lining in everything! So here’s the vegetable broth I made. I remembered that roasting vegetables at a high heat always coaxes the most flavor out of them so I just put a very light film of peanut oil on a large baking sheet, laid out all the veggies and roasted them at 425° for 15 – 20 minutes, before creating the broth with white wine and water on the stove top. It was so rich and flavorful, hard to believe it was just vegetables. Here’s the recipe. Preheat oven to 425 degrees. Put a little peanut oil on a paper towel and slick the surface of a large rimmed cookie sheet. 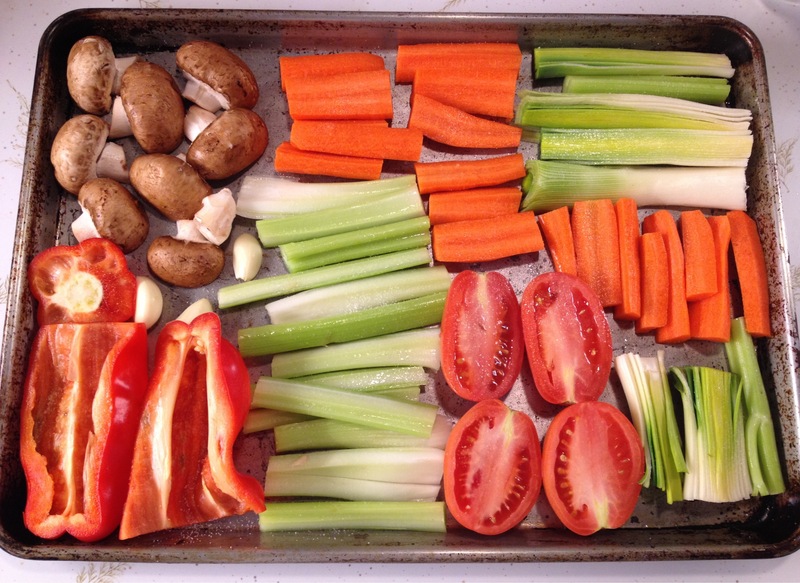 Lay out all your vegetables as shown in the photo and roast for 15 – 20 minutes on the top shelf of your oven. You should be able to smell them and have coaxed some liquid out of them. The leeks and red pepper should also be a little browned on the bottom. 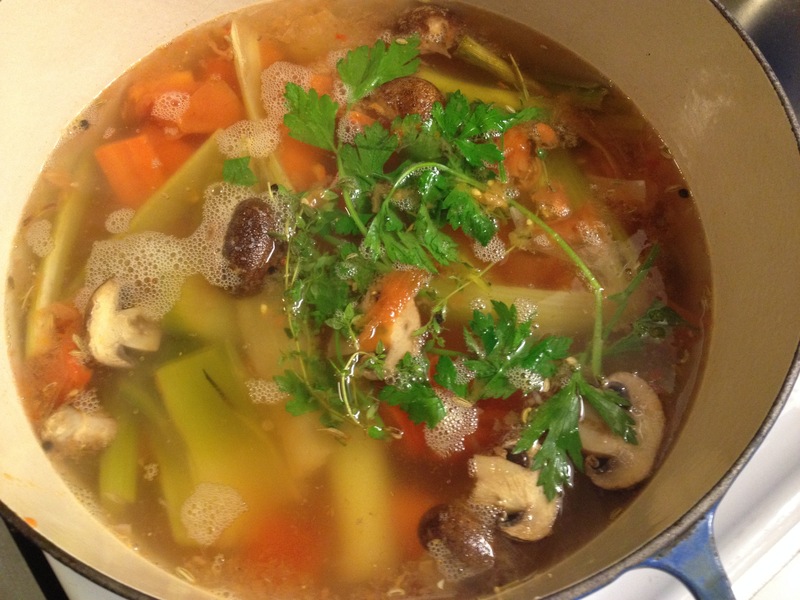 Scrape all the vegetables and their juices into a stock pot and place on medium high heat. Add the cup of white wine and reduce to ½ cup. Add the 10 cups of water, the salt, fennel seeds, peppercorns, bay leaf, parsley and thyme. Bring to a boil and simmer partially covered for 90 minutes. Let cool. Strain broth and store in clean containers in refrigerator or freezer. We must know what we’re eating! 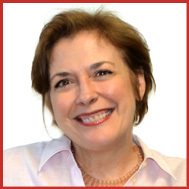 Allan and Paulette – Thanks so much. He has another appointment on the 2nd to begin the process of figuring it all out. Happy New Year xoxo, M.
So sorry to hear of your son’s health problem. I hope it is transient and that he feels better soon. Gretchen and I are thinking about you. Thank you Vic and Gretchen. Happy New Year to you and your family!! Thanks Jen!! Say hello to everyone there! Poor thing! Good thing he’s got a mom who can organize the kitchen like you can. I’m sure what’s happened is horrible but you’ll get him back on track. I’d have been scared out of my wits – poor thing! My best to him and to the whole family. Thanks Maureen! I really was scared out of my wits. Happy New Year! I’m sorry about all your worries for you, your son and your family! I’m sure you’re a most excellent momma nurse, and here’s hoping for a speedy recovery. Francesca, that’s so sweet. Thank you. So sorry to read that your son had such a severe illness. Good thing you are his mother. Your techniques for helping him get back on his feet are inspirational. Hope he is all better soon. Wishing you and your family a Happy New Year. I am so sorry to hear about your son’s medical problems, I do hope everything will be alright. Your roasted vegetable broth sounds great. A very happy New Year! Thanks Suzanne. A very Happy New Year to you and yours! Leave it to you to make lemonade out of the lemon with good veggies. Thank you!! Happy New Year to you! Thanks Lorraine. Happy New Year to you!! Tandy – thanks so much!! Happy New Year to you and yours! The soup looks so good! Hope it helps your son to be a picture of good health!! Thanks Irene!! 🙂 Me too!